I really love pot pie. This one is mostly homemade. I really like using canned potatoes because they keep their firm texture without becoming mushy. Cook your own and feel free to make your own pie crust. I am using premade for time. *While cooking vegetables, after oven is preheated, you can loosen the crust from the tin by putting in the oven for 5 minutes. Saute carrots until slightly tender. Add mushrooms, celery, onion, and garlic until onion is tender, adding poultry seasoning, thyme and cavender's to taste. Place mixture in bowl and add peas and potatoes. Saute seitan until crispy, adding seitan broth or other broth for flavor. Season to taste. Add to vegetable mixture in bowl. Heat oil in the pan you cooked the seitan in and add flour, and nutritional yeast. Stir well until flour is toasty and fragrant. Do not burn. It will not be a roux, but crumbly and coarse. Using the same pan as the seitan will pick up all the nice flavorful bits the seitan left behind. Slowly add broth. It will seize into a thick mixture but keep whisking and adding liquid slowly. Add soymilk after broth for a creamier gravy. It's up to you. Add gravy mixture to seitan and vegetable mixture and mix well. Place in a sprayed nonstick 9x9 2"deep pan and top with puff pastry or pie crust**. I did it in pieces. For puff pastry, follow directions as follows, but carefully unfold the puff pastry (it will be in thirds) and place on top. Do not mess too much with it or it will be tough. Cook for about 20 minutes, until crust is golden. May need to adjust for puff pastry. Seitan Alternatives- Be sure to properly season. -The cheapest one is probably tofu. Try freezing tofu then thawing and squeezing out the extra moisture. It will be like a sponge in appearance and ability to hold water, and it will be chewy when cooked. Mmmmm... pot pie! That looks delicious. Thanks for the recipe and the info on the potatoes. No problem! Hope you enjoy it. If you want a thinner gravy, cut back on the dry gravy ingredients. 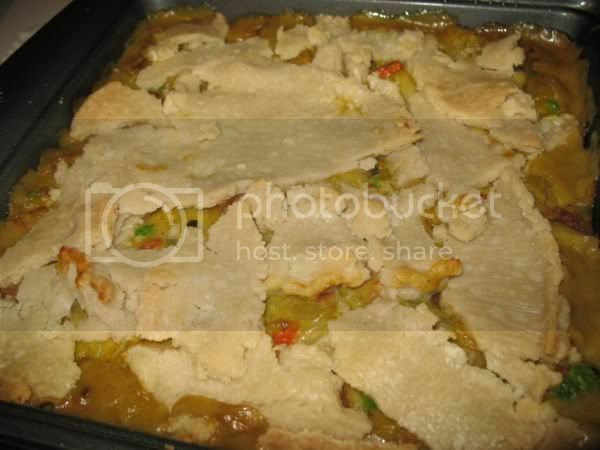 This is a thick pot pie, like a casserole. I love pot pies too; who cares if it's summer right now! Thank you for the recipe. Oh my goodness, that looks so good! 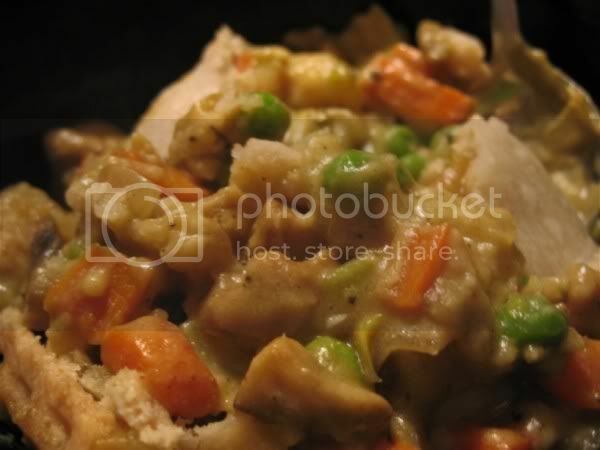 I loooooooooved turkey pot pie as a kid. That looks very tasty! I love how you did the crust. Even though I love to cook & bake, making pie crust seems like torture to me. Even if I somehow manage to roll it out & crimp the edges, the filling inevitably bubbles out everywhere or explodes! Destiny's Kitchen- I see your earlier comment! Maybe you can't see it? I have never purposely deleted posts, so if you post it, it will be up here. This recipe is AMAZING! Yum, yum, my FH loves it too! Amazing so nice posting, I like it.